So you know how to cook and you have an awesome cook top inside your home. You love it and want to take it outside with you. Why not just buy another one and move it into your new outdoor kitchen? Well if you are thinking, “it’s the electrical, the wiring must be better insulated outside” that’s not it. 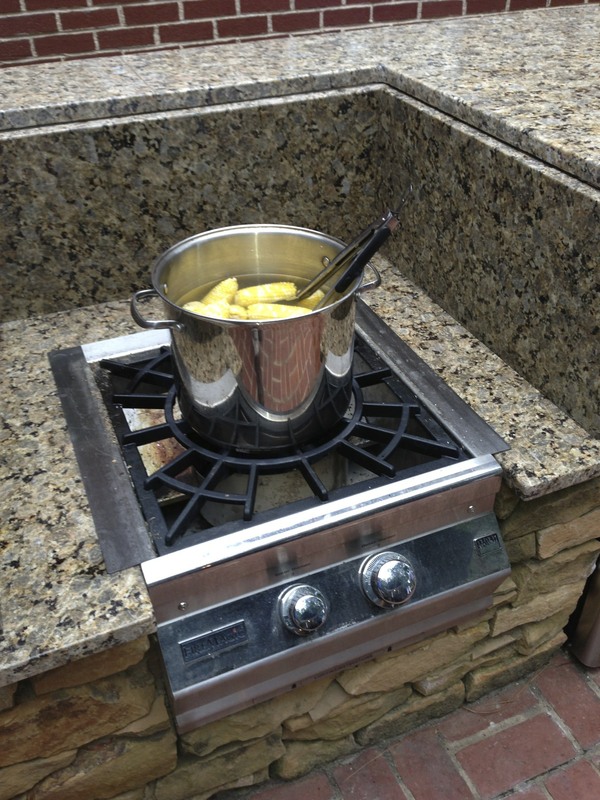 In fact most indoor cook tops don’t have much or even any electrical wiring, nor do most outdoor grills. What is so different about an outdoor grill from an indoor range or cook top? First you have to think about the conditions that all indoor products are engineered to work in. Everyone thinks of water, that’s an issue but it’s not the issue. The conditions inside your home are relatively always dry, about 70 degrees, stable wind conditions, bug free (I hope) and bird free (I really hope). That’s really about it but that’s really a big deal too. Wind is the biggest issue outside. You may be making that incredible HGTV worthy outdoor kitchen that is enclosed on several sides or covered but you will have wind if you have an open wall, if you have ceiling fans you will have a wind and a smoke problem too. Outdoor grills are much stronger that indoor products, they have to be because they have temperature and wind to work around. Water is an issue but it’s more of an issue for the small parts that are used to connect the unit together than for the electrical, the rivets, screws and bolts will rust if they aren’t high grade SS. Water is also an issue for the gas valves on the control knobs, over time a low cost outdoor grill will start to leak from the knobs themselves, not just low cost sometimes the high dollar ones do too. The way the product is built will also keep bugs and birds from making it the top choice during the winter too. So how do you decide which one if the expensive ones and the cheap ones have the same problems? Is it one of those deals where you just buy the cheap one that you like the look of and replace it more often? There are some thing you are just going to accept if this is going to last a long time. A good outdoor grill will cost more than a equally good indoor range/cook top. It is engineered to work in rain, wind, snow, bugs, birds and all the stuff that blows around in storms. Not just to work during these issues but to work after going through these issues for years and years. The screws, nuts and bolts, the bottom pan and the ignitors all are stuff you don’t really see but will determine whether this product will last or not. If they are all of high quality SS they will last if not, you will have a landfill grill on your hands and you’ll be purchasing a new one in a few short years. I have replaced every major brand of grill you can think of. In 5 years of outdoor kitchen consulting, selling, designing, replacing, retrofitting and upgrading I have learned one very valuable guide to choosing an outdoor grill. This is not a popular opinion but I believe that if you want a good outdoor grill you need to buy it from a company that builds (and has always built) only outdoor cooking products. In no case have I found a company that began selling indoor cooking products, later started making outdoor cooking products, make a long lasting, good performing outdoor grill. If you go with brands you are familiar with inside your home you will regret it. The other rule you will never regret following..if it’s made in the USA it’s better quality. The only reason a grill company would make it elsewhere is to get the price way down, it’s not just cheap labor they are looking for. Non US made product uses a different method for grading steel. If they purchase what the Chinese call 304 SS they can market it as such, it is not the same thing as the US standard for 304 SS. Higher quality SS will be easier to keep looking good, last longer, be more resistant to disintegration from heat exposure and hold up better agains all forms or corrosion. Side Burners In many cases this is the commonly chosen product to never get used. It really depends upon the cook. There are people out there that will use the heck out of a side burner but not nearly as many as there are side burners out there that never get used. If you know that you will use it, then add it in, if you are un certain then buy a bigger grill and use one of the additional burners for pots or pans. 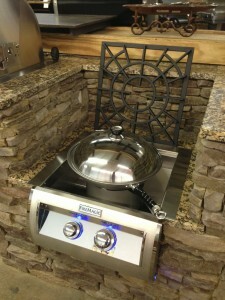 If you are thinking you can use a side burner for low country boil or for deep fry you are going to be disappointed, go with a Power Burner instead. Power Burners are especially nice because they have extraordinarily good range from very high power to very low power. This reason is that the burners are mounted low enough to be out of the wind so the manufacturer can allow them to power down to incredibly low btu ratings without risk that it will be blown out while on. This means you can melt butter or pretty much melt the pot. Mount a few inches below your counter so that the taller pot is still at a good working elevation. These burners come standard with a setup for a WOK. Fuel types include gas, charcoal/wood, electric and pellets. Gas is notoriously the simplest and if you work at it and learn your grill you can create masterful outcomes with gas. The gas flavor debatable and I personally do not believe that there is one. If you are shopping for gas the most important variable is the material that the burner is made of. In the south we have extremely high humidity and often we are along the coast. In my opinion the only material you should end up with is American made Stainless Steel and cast stainless is far better than tube stainless. The key to this grill lasting is how/where that burner is made and if you keep it clean. The soot from cooking food will turn into an acid over time when exposed to humidity and the acid is what destroys your burner. High quality Stainless Steel and especially US made cast SS burners will last the longest when exposed to this environment. Additionally the cast SS burner is so dense that it also holds the heat and offers a much more even distribution of that heat. Charcoal/Wood fire are really the same as charcoal is made from wood. Within charcoals there is lump and there is briquette. These are vastly different and after many thousands of hours cooking with them all I am not a briquette person. Briquettes are made of wood dust packed into a shape and then literally glued together with something and usually it isn’t something I want to eat. Even if you don’t mind that aspect of it the product quickly returns to the sawdust it is made of and that means it doesn’t last very long and quickly covers the bottom of the grill with ash and that means that your charcoal grill isn’t going to “breathe” well. Lump is essentially raw wood that is burned until the moisture and most of the carbon is gone and then the fire is extinguished so you can re light it and immediately enjoy coals. If you buy “good lump” (large size average and all hardwood) if will outlast all other charcoals and is even reusable in the right grill. You can use raw wood, but you need to be sure it’s a hardwood or you’ll get alot of carbon/soot flavor and make a real mess. Additionally if you’re going to use raw wood then be sure it is seasoned so it will light well and burn evenly, you can also get a rant flavor from cooking on unseasoned wood. The biggest reason I don’t advocate cooking with raw wood as the fuel is that it burns very hot and unless you’re only going for steak I find that I am always fighting the grill to get down into the lower temperatures I usually cook within. Electric is not nearly as common primarily as it is being exposed to the outdoor elements and reliability is a factor. We are always looking for good reliable outdoor electric options so if you know of one please let us know. Currently we only recommend electric as an option on portable grills that are put inside when not in use. Pellet fueled smokers are a fast rising category as they offer the convenience of indoor cooking simplicity and the are wood fired for a fuel source. They are usually only good for low and slow smokey cooks but we have found that the Memphis pellet smoker is unique in that they insulated the oven and can guarantee temperatures from 180 degrees to 700 and anything above 295 is smoke free making it an outstanding outdoor oven. The pellets are wood dust packaged into a pellet and they are dropped into a fire box which is lit automatically when you turn it on. This is a much healthier form of fuel than the briquette because they are never using a petroleum product to bond the wood dust usually corn starch. Style of grill; ceramic, flat top, direct heat, indirect heat, fryer, boiler, etc. Within the many fuel types are just as many grill types. Some extremely easy to use and others more work but usually better outcome. Ceramic grills gaining in popularity and for good reason. The most commonly known ceramic grill is probably The Big Green Egg. It is not the first ceramic grill and certainly did not create the product but unquestionably did the best job branding and marketing the product. There are currently about 30 ceramic grills that use charcoal very similar to The Big Green Egg and few have figured it out to the extent that they have. They have the longest and best track record for sure. Hopefully the company is keeping it’s eyes wide open as the competition is serious and coming on very strong. The ones to watch are Kamado Joe and Primo. The most common question I get is what makes the ceramic grill so different? The answer is usually “do you drink coffee and do you drink it from a metal cup?”. The point is that the difference is simply the material the product is made of. All grills are basically ovens but the ceramic grills have an automatic advantage in that they are an insulated oven, that means they use charcoal at a rate of about 400% more efficiency and they hold moisture so much better that I maintain that the reason people love them is that they make the average cook able to turn out uncommonly moist meals. The only downside to ceramics is weight and they are fragile, but only if you move them often. I don’t mean move them across the patio, I mean take them to the beach or mountains with you. They simple are not very conducive to travel. They are very likely the best money you can spend on any cooking appliance however when you consider cooking temperature range and longevity of the product life span (mine is still cranking out the meals and I purchased it in 1993). Infrared grills including the TEC Infrared created the technology and is still without question the best of the best in infrareds. They own the technology so if you aren’t using a TEC infrared burner you’re using old technology and the difference is enormous. This is another case of perfect execution with using ceramics. The product creates a very small gas flame which is burning almost against a ceramic layer which is impregnated into a sheet of glass. The ceramic holds all the heat, spreads it evenly and transfers only the heat through the glass, not the flame. The results are incredible, even heat, high heat and no fire or wind to dry out food. After spending 3 years testing every major outdoor brand there is I am convinced that while this is not the grill for everyone it is the best gas burner there is. It’s reputation is that it is a steak grill, true but it is also incredibly good for seafood, veggies and pretty much everything except low and slow. Partner a TEC infrared with a ceramic smoker and you are free to cook anything that interests you…masterfully. Flat top grills are not as well known but we really love them. This could easily be the best solution for “family style” outdoor cooking ever made. In the restaurant world most of the menu is done over a flat top. If you have been to a japanese steak house you have probably marveled at how easily they can cook anything you order in front of you and very quickly over a flat cook surface with no visible flame. That is exactly what we’re talking about. The number of flat top grills for the outdoor market is pretty limited but they ones that are available are really nice. EVO is the leader in the business and definitely the one to check out. Direct heat is describing any grill where the heat of the fire (regardless of the source) is traveling in a straight line directly to the food you are cooking. It is generally more for high heat cooking and is usually less consistent in heat distribution. A charcoal grill or a gas grill where you look in and see the heat source is a direct heat grill. They are prone to flare ups and a greasy cook can get out of hand very quickly. Indirect is often the same grill with some type of device, usually ceramic, between the food and the heat source. In that case the heat is traveling around the “deflector” and the grill behaves more like an oven with even heat coming from all directions. This is usually, but no always a medium to low temperature cook. Some setups will have one side of a grill gererating the heat and the food on the other side so the heat is present but not under (or direct) the food. Some will argue that indirect/direct is not a type of grill but a style of using a grill, they aren’t completely wrong as you can do this with most grills but it is true that some grills are specifically designed with one or the other in mind. If deep fry or boil cooking is your thing than you can easily add a burner for this. The typical single or double side burner will not suffice however you’re going to need something stronger, check out the Firemagic Power Burner. 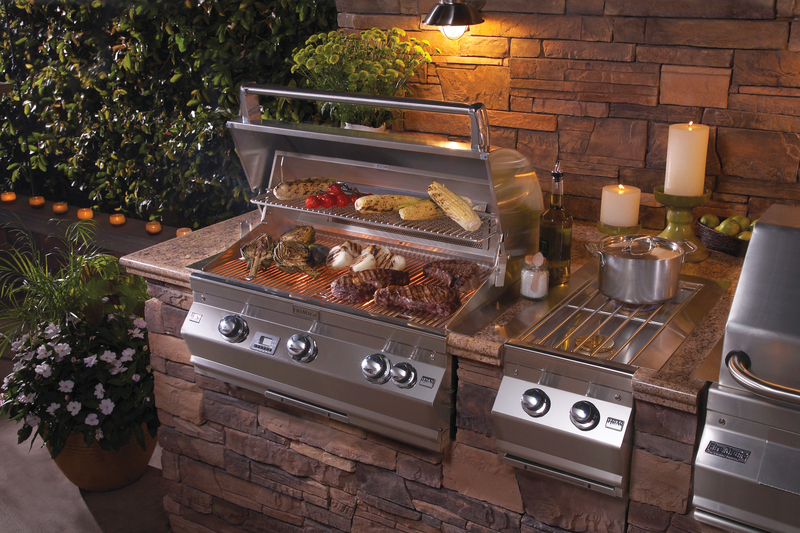 Most common choices for gas grills in outdoor kitchens by price point: each name below is a clickable link. Maybe seeing some installed grills in our beautiful projects would be helpful? Please note that Fireside Outdoor Kitchens sells anywhere in the continental USA. Please reach out to us for additional information or to purchase your outdoor kitchen, appliances, accessories, etc. Fireside always charges internet pricing in the store an anywhere else. Remember to shop product by model number to ensure you are comparing the exact same thing.